The weekend of 4/5 August 2018 saw Branch members from the UK, France, Holland and Jersey competing at Bisley for the coveted Metford Trophy. This is a demanding match comprising the aggregate of 15 shots fired at each distance, 1000, 1100 and 1200 yards, with muzzle loading match rifles. Whilst many will have been enjoying the hot dry summer, for the long range shooters it brought its own difficulties. Besides the discomfort of shooting in such weather, conditions were challenging. Once in a while there would be some uniformity in the wind flags on the range, but for much of the time each appeared to have a mind-of-its-own! Watching the mirage in light wind conditions can help, being more responsive to rapidly changing conditions than wind flags. However, with mirage alternately boiling, running left-to-right, then reversing, conditions became a battle of attrition! Despite the conditions there was some excellent shooting. 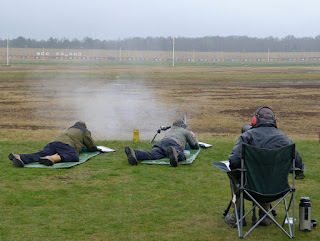 David Minshall took a strong lead at 1000 yards on the Saturday (this stage being fired concurrently with the MLAGB National 1000 yard Rifle Championship). The following day at 1100 yards Alan Beck fought back and significantly reduced David’s lead. At 1200 yards Gary Evans was top scorer for which he gains a bar to go with the special Hepsworth Medal he has won previously. Alan again shot well and finished with an aggregate of 113.3; David meanwhile had kept a steady day shooting and finished on 115 to win the Trophy. Bernard Collot had a good day at 1100 and 1200 yards, and was rewarded with third place on a score of 104. The Branch competition season commenced on 8 April at Bisley. The match was the Volunteer Trophy, for military match rifles, and fired with open sight. 15 shots at 600 yards. Shooters on the first detail only had to contend with a gloomy sky and lingering smoke in the generally calm conditions. What wind there was wasn’t enough to blow the already rain soaked wind flags around much. The second detail was much the same conditions, but with the addition of rain! Despite shooting in the miserable conditions of the second detail, John Whittaker had a tremendous shoot and convincing win.